What is FERTILIFY Health + Beauty? FERTILIFY Health + Beauty is a supplement designed to enhance fertility and prenatal well-being by improving egg cell quality and hormonal balance. It also helps maintain the strength of hair, nails, and skin. FERTILIFY was designed by fertility doctors to help aid women support and maintain reproductive health while also maintaining strong hair, nails, and skin. 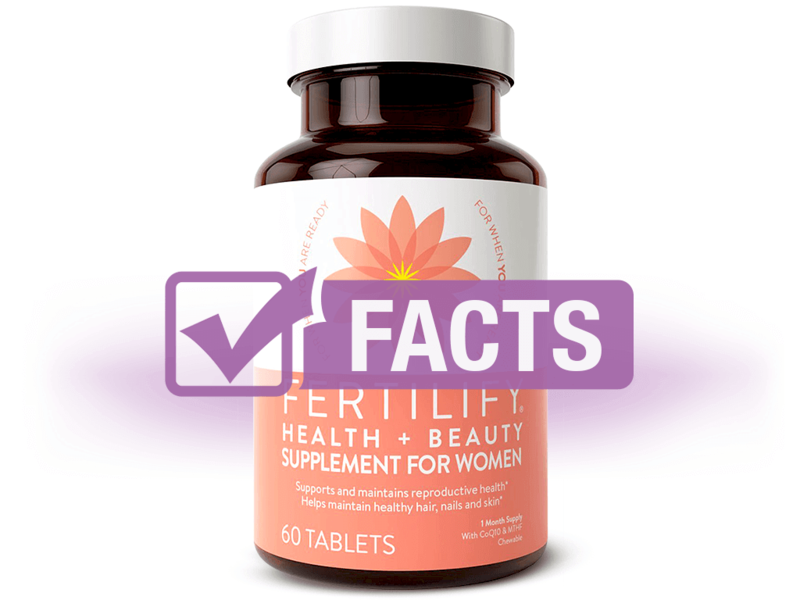 The health and beauty supplement's antioxidant blend assists with improving fertility. For example, CoQ10 and vitamins C & E improve egg quality by removing free radicals from the eggs. Vitamin D is added to enhance the ovarian reserve; vitamin B12 helps process foods into energy, and biotin is renowned for supporting hair, skin, and nail health. Vitamin C - required for wound healing, a healthy immune system, the absorption of iron, collagen development, etc. This supplement does not contain GMO ingredients, artificial colors, or artificial flavors. The company does not offer any information pertaining to the safety of long-term use of FERTILIFY Health + Beauty. However, women who are pregnant, breastfeeding, or taking blood pressure medications or blood thinners should consult with doctor before use. 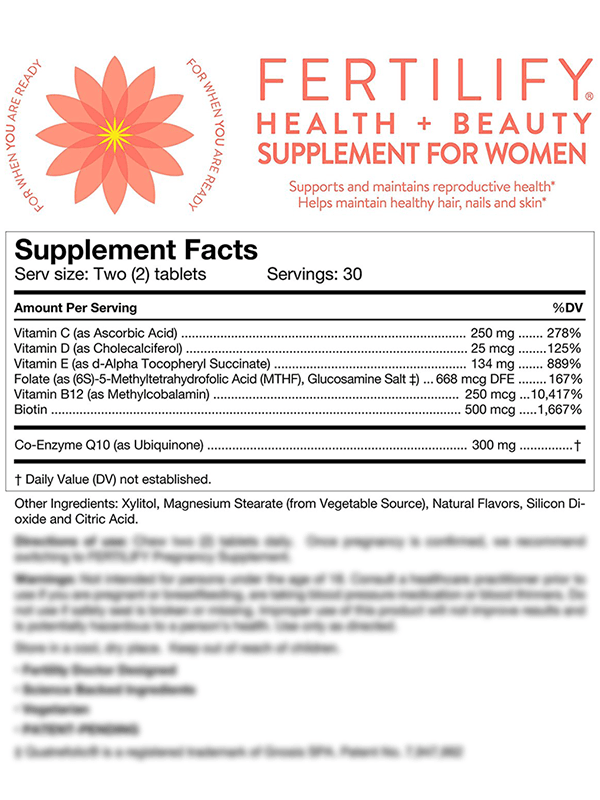 On the website, there is no mention of possible side effects of FERTILIFY Health + Beauty. Because this is a natural supplement, it is important to remember that it may not work with everyone. Some Amazon users do mention side effects of an upset stomach. Positive reviews rave about FERTILIFY allowing them to fall pregnant within a couple months of use and having a bearable taste. Negative reviews focus on the fact that the supplement didn't work for conception and caused symptoms of gastrointestinal discomfort. No further sources of reviews present on other websites. As a dietary supplement, take two tablets daily. Once pregnancy is confirmed, it is recommended to switch products to FERTILIFY Pregnancy Supplement. Store in a cool, dry place out of reach of children. FERTILIFY Health + Beauty can be acquired through Amazon, purchased from the company website, or bought from participating IVF clinics. I am truly passionate about helping others find the path to better health, wellness, and spirituality through yoga. I blog at Anita's Wellness Journey.